We all know the importance of a healthy, well-balanced diet. 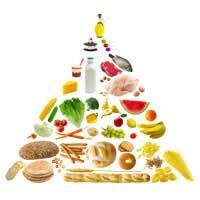 To help us keep on track with daily nutrition we have the food pyramid as a guide. It offers simple to understand guidelines for daily nutritional intake and it's easy to remember. The foundation of the pyramid is made up of bread, potatoes and cereal which should be eaten at least six times daily. The next level is comprised of fruit and vegetables. You should eat at least five portions of these and this can be in the form of fresh fruit and vegetables, cooked, salads or juice. The next level is dairy, and should account for three daily servings. Moving up, there should be no more than two servings of meat or fish per day. At the pyramid's peak are treats such as chocolate, fast food, biscuits, sweets and cakes, which should be eaten only once a day, if at all. Measure servings at home with a food scale and measuring cups until you become comfortable estimating the sizes. Keep a food diary. Research shows that this helps people stick to a healthy diet. Break leftovers down into individually sized containers so that they are easy to grab and reheat for a single serving. Eat a salad before lunch and dinner. It will fill you up quicker and help you stick to smaller servings of your main course. To prevent impulse eating, plan meals in advance. Many restaurants serve large portions, so share a meal with a friend or take some home in a doggie bag. Buy snack foods in individual servings or break down larger bags into smaller sizes at home. Keep dishes of food off the table while you're eating, so that you are not tempted to reach for seconds. Keep meat as a side dish rather than the main part of your meal. Don't forget that water is an essential part of your every day needs. Your body is made up of around 75 percent water. Every system in your body depends on water. It carries vital nutrients to your cells, flushes out toxins, and it provides a moist environment for your ears, nose and throat tissues. So how much water should you drink each day? We've been hearing for years that everybody should be drinking at least eight, eight ounce glasses of water every day. But according to experts at the National Academy of Sciences and the National Institute of Health, they cannot name a single study that says that proves this to be the case. According to Dr. Gary Robertson, Endocrinologist from Northwestern University, Chicago, there's no need to worry that you're not getting enough because the thirst mechanism is powerful and effective at regulating our day to day requirements for fluid intake and keeps it in perfect balance with our needs.